If there’s a Movie God out there, they really didn’t want my Mom and I to see this film. We tried to see this film on three consecutive days. On Sunday, the car wouldn’t start. On Monday, we accidentally went to the wrong theater. And on Tuesday, we were running very late. We got in just as the movie was starting, just barely making it. Bottom line, that’s a lot of effort going into seeing a movie. But was it worth it. I’ll admit this was one of my most anticipated films of the year, but while the end result is a good film, it seems like I may have hyped this one up too much, not to mention watching the trailer too many times to count. Burton and Adams are two great tastes that don’t taste that great together. But don’t let that mistake you, this is a very good film. 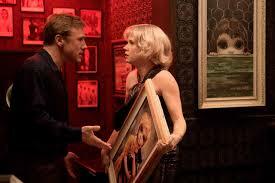 It does have a good screenplay, and a good understanding of Margaret Keane’s story. It’s not perfect, but I accept it in it’s own way. I like how the relationship between Margaret and Walter is portrayed, with Adams & Waltz working great off each other. The two create a believable relationship that starts off as love and gradually becomes abuse. Performance wise, we have Adams, who is definitely good in the role, but somehow, I expected a lot more from her. I don’t know, I guess I really wanted to be blown away and instead I was given a solid performance in a solid film. She doesn’t even give the film’s best performance – that honor goes to Christolph Waltz. In every review for this movie I’ve seen, people seem to either love or hate Waltz’s performance. And I’m in the love camp. Being Tim Burton, there’s some great costumes and cinematography, and composer Danny Elfman once again impresses in the musical department. I also like Lana Del Rey’s contribution to the film, however brief it may be. I am really interested to see where Burton takes his career after this, and though it’s not as great as I would have liked it to be, and it does have a number of narrative issues, I do think the film is an enjoyable view of art appreciation, abusive marriages, and how women were viewed in the 50’s an 60’s. It’s worth a watch or two. I want to see this, but will wait for it for home viewing. There’s too many other films I want to see. Glad Tim Burton is stretching himself in different directions. I really liked the look of this movie. It was like watching a moving painting and I thought that was a neat touch stylistically. However, I think the plot itself kind of unravels and it seems to spin its wheels for a while before wrapping up way too quickly in the final 10 minutes. I like what you said about Adams and Burton being two great tastes but just not together. This had the makings of something fantastic but didn’t seem to fully come together.